Eighteen years after igniting the vampire craze in mainstream pop culture with his film Interview with the Vampire, director Neil Jordan returns to the genre with his latest film, Byzantium. Thanks to the Twilight and Underworld franchises, not to mention shows like True Blood and The Vampire Diaries, the vampire genre has become oversaturated. This ultimately begs the question as to whether or not there is anything left in the genre for Jordan to explore? Neil Jordan’s tale revolves around Clara (Gemma Arterton) and Eleanor Webb (Saoirse Ronan), a mother and daughter duo on the run. Fiercely protective of her child, Clara will do anything to provide for Eleanor, even if it means stripping or resorting to prostitution. Unlike her mother, Eleanor is a loner who is burdened by the events of the past. She spends her days writing out family secrets only to discard them in the wind. One day Clara meets Noel (Daniel Mays), a meek but well-meaning man whose recently deceased mother owned the rundown Byzantium hotel. Clara woos Noel into letting her and Eleanor stay at the hotel. It is while in the small coastal town that Eleanor meets and falls for Frank (Caleb Landry Jones), a young man suffering who is a hemophiliac. When Eleanor decides to let Frank in on her secret, she inadvertently causes the past to finally catch up with them. 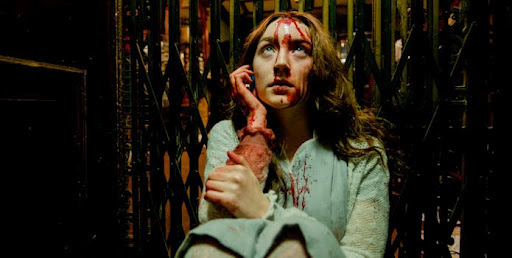 To its credit Byzantium finds several innovative ways to re-work the traditional vampire tropes. While vampires still need to be invited into a house before they can enter it, everything from how they are created to how they operate has changed. For example, none of the vampires fly, but instead travel like normal humans. They also roam freely in the daytime with no problems. These elements work swimmingly because Jordan never draws much attention to them. 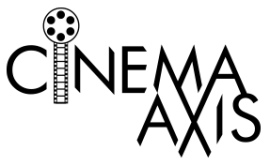 In fact, the word “vampire” is rarely used in the film. This modern take on vampire lore is exhilarating especially in regards to the moments of action. However, it is when the film drifts into the past, which happens frequently, that it feels plodding and formulaic. Aside from the creation segments, of which I could spend hours soaking in the beauty of the waterfall of blood, most of the weakest plot moments and acting occurs in the period piece segments. The film feels most alive creatively when focusing on Clara and Eleanor in the present. At times it feels like Byzantium loses sight of the fact that it is not Eleanor’s sadness, but Clara’s fight with the mysterious brotherhood that is the most interesting aspect of the film. It is rare that we get to see such a strong female character in a genre made up primarily of male archetypes. For her part Arterton does a great job of playing up both Clara’s sexual and physical power. Ronan is fantastic as the sullen Eleanor who moonlights as an angel of death for the elderly. She once again proves why she is one of the premier young actresses working today. Byzantium is a film that is enjoyable enough to pass the time, but it needed to rearrange its segments to truly be memorable. If Jordan had stuck with the bloody but thrilling present, instead of focusing so much on the past, Byzantium would have been more than just a standard vampire film. thanks for this. I'm still looking forward to it. While not Neil Jordan's best film, Byzantium does offer enough to at least entertain you on some level. You're right. It's about half an hour too long, which could have been trimmed by eliminating the back story except for the eye-catching waterfall of blood. The stark but beautiful cinematography is what made it worthwhile for me. The cinematography is indeed fantastic in the film, especially the sequences set around the waterfall. you say 30 minutes too long. Whereas, I say it's 30 minutes too short. What would you have sad if 'The Dark Knight' was 30 to 45 minutes shorter. Probably something negative. What is lacking is the complete story of all the characters. That in of it self is the problem, the lack of complete story telling. Less time does not add to a story like this, More time adds to it.